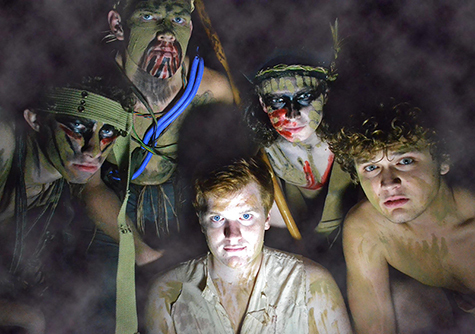 This weekend, Manchester University Theatre Department continues its growing tradition of challenging audiences with its immersive performance of William Golding’s literary masterpiece, Lord of the Flies, as adapted for the stage by Nigel Williams. At the cusp of war, England sends children out of the country to protect them; one of the planes crashes on a remote island. Surviving the crash, a group of British schoolboys struggles to maintain a semblance of society. As months wear on and extreme personalities surface, the children come to realize horrors do not come from war but human nature itself. “The show is very physical – filled with action,” says Director Joel Froomkin. “Our set is huge – spilling out into the entire auditorium – and the audience will have a unique, immersive experience with the actors all around. The show has been a huge undertaking but I think it will especially appeal to collegiate and teen audiences because they’ve all read the novel. “And, of course, it’s the granddaddy of The Hunger Games. There is great motivation in doing a project that you think has the potential to convert people that dismiss live theatre as dusty and dull,” said Froomkin. Manchester’s rendition will run for three nights at 7:30 p.m. – Saturday, Oct. 11, Sunday, Oct. 12, and Monday, Oct. 13, in the Wampler Auditorium on the west end of the Administration Building at the North Manchester campus. The play contains intense violence and is not suitable for small children. Lord of the Flies features the talents of Adam Dundas, Joshua Dold, Kenzie Hare, Jacob Ray, Clayton Marcum, Daniel Turnbow, Murray Hammond, Christopher McAleavey, Kortney Jennings and Jacob Archambault. Director Froomkin, MU coordinator of theatre organizations and productions, is also co-owner and director of The Different Stages Theatre in Huntington, Ind. Patrons are advised to arrive early because the Wampler space is so intimate, Seating is limited and is available on a first-come basis. Tickets are $7 to the general public and free to students.